DUBAI, 6th March, 2018 (WAM) -- The Dubai International Humanitarian Aid and Development Conference and Exhibition, DIHAD 2018, is discussing on the 2nd day many topics of high importance in humanitarian aid and development including ‘Innovative methodologies and enhanced resilience’ and ‘Development and Conflict prevention’ among others, focusing on the theme ‘Emergency Aid’. On the second day of DIHAD 2018, a special session was dedicated to discuss the outcomes of ‘The World Humanitarian Summit’, which took place in Istanbul in 2016, laying out the ‘Agenda for Humanity’ and committing itself to alleviate suffering, reduce risk and lessen vulnerability on a global scale. While giving his keynote address, Mourad Wahba, Assistant Administrator and Director Regional Bureau for Arab States, at the United Nations Development Programme, said, "We are living in unprecedented times, with more people than ever living in a state of crisis and fragility. 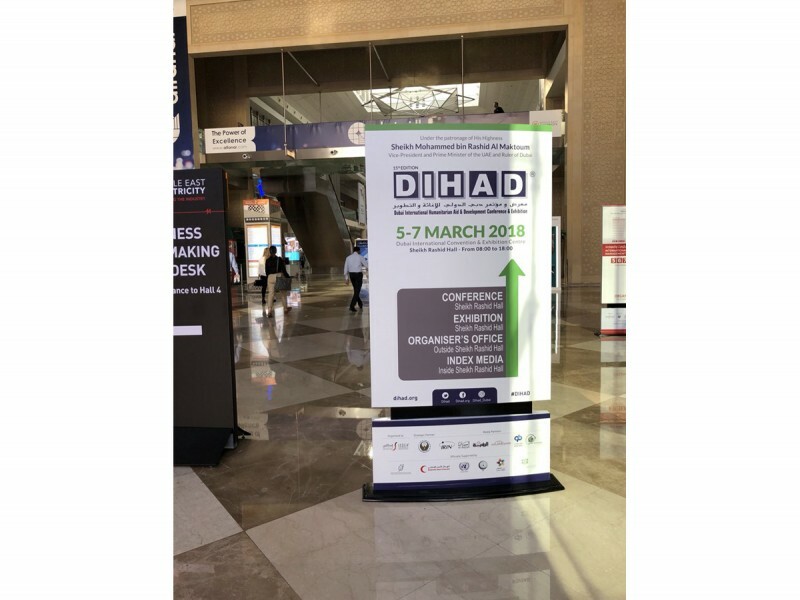 DIHAD is an important opportunity for decision-makers from all branches of the international community, to come together and sharpen our agenda by bringing our humanitarian and development work in concert." "DIHAD allows us to meet the humanitarian needs of various countries and communities while also help us in finding durable solutions that reduce such needs in the future. This will also enable us in laying a strong foundation for achieving the Sustainable Development Goals, SDG’s, and strengthen our resolve towards lasting peace. At the United Nations, we thank the Vice President, Prime Minister and Ruler of Dubai, His Highness Sheikh Mohammed bin Rashid Al Maktoum, for his vision in bringing us together to sharpen our collective response at a time when it is most needed." Claus Sorensen, Senior Advisor to the Government of Denmark on Resilience, Humanitarian Aid and Crisis Response, said, "Conflict and disasters driven by population pressure, water shortage, pandemics, climate change and destructive power politics are bound to increase around the world. At DIHAD 2018, professionals of humanitarian aid and development benefit from the hospitality of the UAE and share their views and suggestions on how to save innocent lives and work more effectively to prevent further catastrophes. The proximity of conflicts in Syria, Yemen, South Sudan or Libya serve as a stark reminder for the participants to find solutions." Commenting on their participation in DIHAD this year, Toby Harward, Head of UNHCR’s Office in the UAE, said, "We are proud to participate at another round of DIHAD, one of the world’s top humanitarian exhibitions and conferences. At a time of unprecedented forced displacement around the world, Member States, the humanitarian community and all engaged stakeholders need to find new opportunities, and creative, innovative and sustainable solutions to better manage one of the most important issues facing our planet today." According to United Nations High Commissioner for Refugees's, UNHCR’s, latest data which is based on information available as of 15th May, 2017, 20 people are newly displaced every minute of the day and over the past two decades, the global population of forcibly displaced people has grown substantially from 33.9 million in 1997 to 65.6 million in 2016, reaching a record high. UNHCR report highlighted that a rapid rise in internally displaced people was concentrated between 2012 and 2015, driven mainly by the Syrian conflict along with other conflicts in the region including Iraq, sub-Saharan Africa, the Central African Republic, the Democratic Republic of the Congo, South Sudan and Sudan. During the session, Yasmine Sherif, Director of Education Cannot Wait – hosted by UNICEF, said, "DIHAD reminds all of us to constantly seek both humility and excellence in the way we serve people in emergencies and crises. For Education Cannot Wait, a Global Fund for Education in Emergencies established by the World Humanitarian Summit, this means humanitarian speed with development depth, less bureaucracy and more accountability."